One of the reasons why we like what AD Koncept does is because they deal with extreme bikes in extreme ways. Even though most of their most insane creations remain only virtual bikes, the idea behind such wacky builds is as strong as it gets. On the functionality or practicality side, some of their bikes may be way too extreme for the real life, but again, nothing can stop us from dreaming. 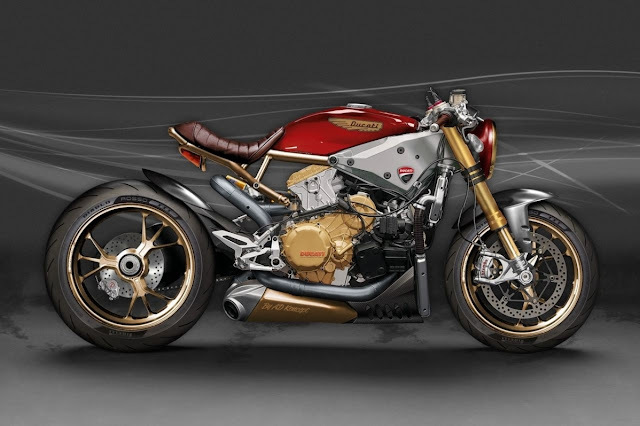 The latest AD Koncept creation is a cafe-racer derived from - breathe deeply - a Ducati 1299 Panigale. For some reason, the very idea makes us smile, because a 205hp, 1,285cc cafe-racer sounds ludicrous. This bike is hardly the best choice for strolling through the busy city traffic. A 1299 Panigale would be so much better off speeding on the highway, regardless of what it looks like, fairings or not, and other details. We don't have anything against chopping off the tail of a Panigale. If one really wants a cafe-racer so badly, the tail simply has to go. Honestly, the rear of AD Koncept's rendering looks quite amazing, stressing out the compactness feel. The single-sided swingarm makes the rear section of the bike appear more massive, a most welcome illusion if you ask us. And that is because making a stripped Panigale look good is a nut tough to crack. Naked sport bikes look great in technical pictures that show what's underneath the high-gloss fairings, but leaving them like this as a"finished" product is seldom palatable. Even so, AD Koncept appears to have nailed it, as the 1299 Panigale cafe-racer doesn't cause any eye sore. The retro-ish color palette helps this Panigale look better, and that old Ducati logo on the tank was simply a brilliant choice. We'd certainly like to see how the huge round headlight matches the bike's overall attire, but AD Koncept have not done such a rendering, unfortunately. Can you imagine this bike near the Kawasaki Ninja H2R Streetfighter in your garage?